Sleep is so important to me and that first year of life can be exhausting. Anything that helps to get your baby to self soothe and sleep longer is totally worth it! The Baby Einstein Sea Dream Soother was one of those lifesavers for us. If you are expecting a new addition to your family, or you have trouble getting your little one to sleep, then definitely try this out. If you are heading to a baby shower, this is a great gift for new parents too! This soother is “magic” at putting the baby to sleep or back to sleep in the middle of the night. It attaches safely to the crib with an adjustable strap. It plays 25+ minutes of gentle music and the underwater show is mesmerizing! As the soother plays it also gradually dims and quiets the music, which really helps with setting the stage for sleepy time. The Sea Dreams Soother has 2 levels of volume; gentle and normal. I preferred to keep mine on gentle so that my other children wouldn’t be awakened if my baby suddenly turned it on in the middle of the night. My baby loved the music and light show! The 4 sea creatures all move slowly to different rhythms and in different directions, which makes the scene mesmerizing to watch. The light show gives the appearance that the animals are really underwater which adds to the ambiance. I suggest trying all the different settings to see which one seems to work best with your child. The Baby Einsteins Dream Soother is powered by 4 “C” batteries. We used our dream soother every night and also during daily nap times. Our favorite setting was the music and light show which uses up the most battery juice given there is music, movement, and lights. Despite all of that usage, we could usually get around 45 days out of a set of batteries before we needed to replace them. For a parent of littles, that is a small price to pay for precious sleep! Eventually, we made the change to rechargeable batteries for almost all the kids’ toys, they are great! Why didn’t we do this before? The fact that this dream machine has a remote control is genius! Too often I would hear my baby make a few noises of discomfort and I would rush in tiptoeing quietly to check on him. Somehow my baby always seemed to know I was close by and would whirl his head around in my direction. Once he saw me, then the real crying began! For that reason, I love the remote control feature! It has a convenient handle so that you can hang it on a doorknob. I would leave the remote hanging on the nursery door and instead of opening the door to check on my baby, I would press the star button from outside of his room and the lullabies would start. The remote works from up to 12 feet from the dream soother which should work well for most nurseries. As your baby gets a little older the Sea Dreams Soother is great for letting them put themselves back to sleep if they awake in the middle of the night. The easy to push, star-shaped button on the soother can trigger music with a gentle kick or pat from your baby. That same star button turns it off as well. There were several nights when my youngest was under the age of 2 that I would hear music in the middle of the night. I knew he was putting himself back to sleep and I drift back to sleep as well. I was very grateful for this sleep machine! Super Mom Tip ~ One of my favorite uses for the Sea Dreams Soother is when I wanted to sleep in a bit more on the weekends, this device would entertain my baby while I got an extra 30 mins to an hour of rest! Oh, the places you can enjoy this dream machine! The adjustable strap makes the dream soother work on most all cribs. If your baby is still in a bassinet or co-sleeper, no problem. Just remove the attachment and it can sit on a tabletop or stand next to baby. It can also be used in your vehicle for long trips that you want baby to be content or sleeping. The adjustable strap can be mounted to the back of a headrest for baby to view the light show. Just make sure you bring the remote so you can safely start the lullaby show while driving! If you’ve ever flown in an airplane with a baby, you know that it is quite a chore to keep them quiet and happy! Baby Einstein Dream Soother is to the rescue just like rocket! 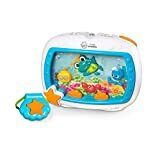 (if you’ve watched little Einstein’s you got my joke) It is very hard to entertain a baby for a long flight, so bring this along for the ride to keep them preoccupied or to help them get to sleep. Your fellow passengers will thank you! 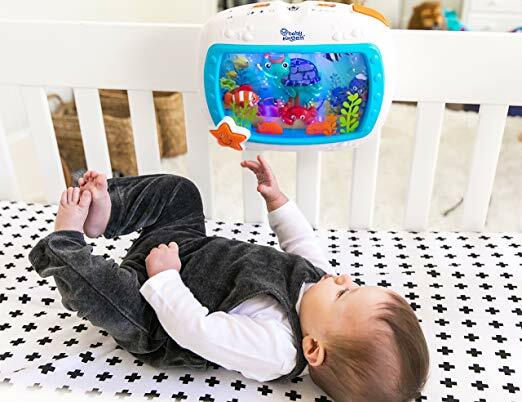 There is a lot to like about the Baby Einstein Sea Dreams Soother and it was a lifesaver for me! There is nothing more valuable than some quality sleep for new parents, and this one certainly helped out in that regard. My baby has continued to enjoy it even up to age three. I hope it works as well for you as it did for me! Man I wish I had this when I had my youngest. He was colic and it sounds like this would have been a lifesaver! Thank you so much for sharing your review! We had a similar soother for my daughter and she loved it, it was the best tool to get he to sleep! Looks like an awesome device! I know someone I can recommend it to, she will be so happy to get her sleep back. Thanks for an amazing share! Great review! Looks like Baby’s Einstein Sea Dream Soother is a life saver with a remote control . What a great review! Anything to help our little ones sleep at night! Thanks for all the info! You’ve given a detailed review. This device looks good. I Would definitely recommend it others. Who is not fascinated by the sea? This is a fun toy for kids I love s the sea theme ideas. Its also looks like a mini aquarium except the fish will not needed to feed and will never dies. Okay so I definitely need one of these now!!! My baby girl would love this soother, I’ve always wanted one for my son but never got one. Now is my chance I guess! This is so cute! I love to have this for my baby! She for sure will love this in her crib! We had something like that for my son and he loved it! Aww I love Baby Einstien products! This is so cute! I wish I could’ve had this when my kids were in cribs! My sister-in-law is having a baby in May, I think this would make a cute gift! Thanks! I remember when my babies were smaller this is EXACTLY what we had all the Vivaldi and Mozart and Beethoven. What a wonderful item to have for a newborn. The soother seems like it is such a comfort to a baby. Would love to try it.